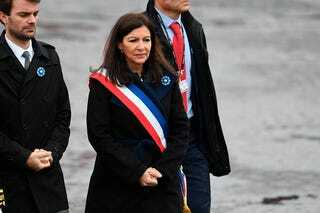 Socialist Mayor Anne Hidalgo made her announcement on Twitter, adding that she reserved the right “to prosecute the organizers for discrimination,” because 80 percent of the festival will not be open to everyone. The Nyansapo festival, which says its objective is to build “Afro-feminist strategies to end racial, patriarchal, colonial and capitalist violence,” is scheduled to take place July 28-30. Organized by the Afro-feminist collective Mwasi, the festival was set to take place in four venues—with three of the four gatherings to be exclusively for black women, black people and “women experiencing the racist hegemony,” while the fourth one would be open to everyone. Interestingly, so-called anti-racist organizations like Licra joined the fray, as did SOS Racisme, which, according to The Guardian, described the Afro-feminist event as “a mistake, even an abomination, because it wallows in ethnic separation, whereas anti-racism is a movement which seeks to go beyond race” (because, hey, nothing brings whites together like anti-blackness). Mother’s Day is a triggering day for many women, but there is also joy and community and love. Mwasi also denounced the fact that a socialist mayor could echo the claims of the far right and said that the festival never publicly “prohibited white people,” as Hidalgo claimed. Mwasi further noted that only the public event is to take place in a venue owned by the city of Paris, and therefore, the mayor has no jurisdiction over the others. Read more at Telesur and The Guardian.